대완구(大碗口)는 전체 길이 64.4㎝, 포구 지름 26.3㎝이며 조선 헌종 11년(1845)에 유희준과 김형업에 의해 청동으로 만들어졌다. 모양이 매우 소담스럽고 장중해 보이며 겉에는 대나무 모양으로 5마디를 나누었다. 약통의 손잡이 부분에는 좌우에 2개의 작은 구멍을 뚫었는데 왼쪽의 것은 발사과정에서 유사시를 대비하기 위해 예비로 설치한 것이다. 포의 끝 부분은 지름 28.8㎝의 원형으로 포에 대한 상세한 기록이 적혀 있다. 현재 유일하게 남아 있는 대완구(大碗口)로 제조기법이 우수하고 보관이 잘 되어 국방과학문화재로서 조금도 손색이 없는 유물이다. Called wangu or daenggu in Korean, this mortar is a type of firearm that can be shot by ignition on a wire. Choe Hae-san (1380-1443) is said to have invented it during the reign of King Taejong (r. 1400-1418) of the Joseon Dynasty. A mortar consists of three parts: a bowl-shaped muzzle, a barrel, and a powder chamber; a large stone or a metal ball is placed on the muzzle to be shot. The powder chamber is the place where gunpowder is put, and it has two ignition holes into which an igniter is put. 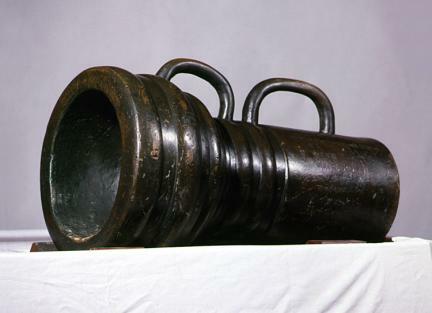 In the middle, between the powder chamber and the muzzle, is the barrel, where there is a wooden piece for conveying the explosive force that occurs when gunpowder explodes to the muzzle. 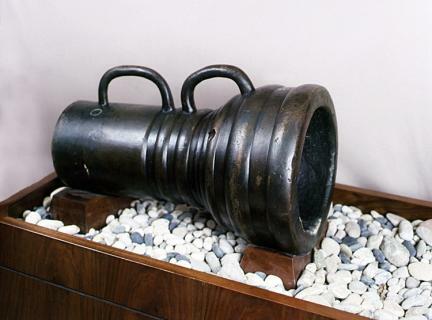 With total length of 64.4 cm and gun muzzle diameter of 26.3 cm, this large mortar was made of bronze by gun craftsmen Yu Hui-jun and Kim Hyeong-eop in 1845 (11th year of King Heonjong’s reign). The shape is very nice and grave-looking, and the outside has been divided into five joints in the shape of a bamboo tree. The handle part of the powder chamber has two small holes, with the hole on the left installed in preparation for emergencies during the shooting process. 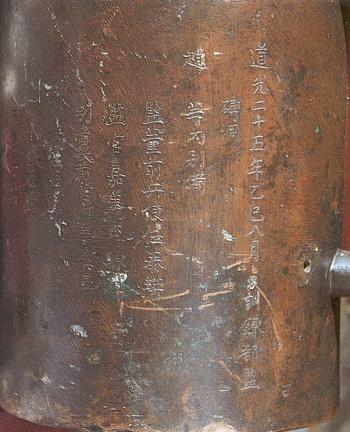 The end part of the gun has a round shape with diameter of 28.8 cm as well as inscriptions engraved with detailed records such as illustrated training guide, instructor, etc. This is the only surviving case for a large mortar. The manufacturing technique is superb, and it has been preserved and stored well; thus making it a superior national defense science cultural heritage.